Closing the Government Was Impossible. Let’s Stop Pretending Otherwise. On a flight out to California earlier this month, the two men seated next to me shared a chuckle about the government “shutdown,” then in its second week. “Exactly,” nodded Mr. Window. “Just goes to show we’re better off without the whole darned thing,” he said. Better off without what, Mr. Window? The government? 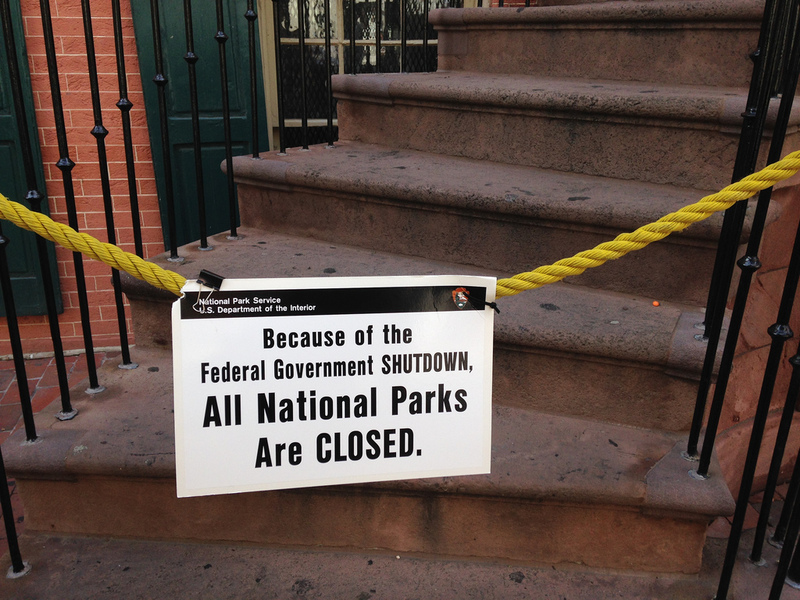 Or this charade of a shutdown? Shame on me for putting on my headphones to drown out this nonsense, rather than engaging. This conversation, after all, was taking place at an altitude of about 15,000 feet, as we were still climbing on a flight path charted by air traffic controllers who are part of the “whole darned thing” Mr. Window presumably didn’t think we needed. Maybe he’d like to wing it blind in the congested air space around Washington, or take a bus across the country, but I sure didn’t. Nor would I have wanted to get on the plane had it not been screened for weapons by the TSA. Indeed, even with all the revelations by a certain government contractor who betrayed his country and fled to Moscow, I’m still grateful for the efforts of agencies like the NSA to help keep us safe from terrorist attacks when we take to the skies. And so, I was certainly glad the government “shutdown” hadn’t interrupted any of these vital government functions indispensable to a modern society. The government has since “re-opened,” (you catching my drift with these air quotes?) but this overheard conversation, the sentiments of which were an ad nauseam staple on cable TV, still grate on me, especially as cable’s blathering speculation shifted to who “won” or “lost” this round and whether we might be in for another “shutdown” during the next fiscal “showdown” in Congress. This is all a tiresome Washington game—the whole government didn’t really shut down, couldn’t shut down, and it’s reprehensible that politicians on both sides of the aisle conspire to allow such a farce that further erodes people’s confidence in government by pretending it can be shut down with only minimal disruptions, such as the closing of national parks. To be sure, there are laws on the books that don’t allow for a full, genuine shutdown when Congress fails to appropriate money for the current fiscal year. Agencies involved in national security, foreign affairs, the administration of entitlement programs, law enforcement, and the safeguarding of life and property (which can be broadly defined) are charged with carrying on as best they see fit with unsalaried employees. This is essentially Congress setting up the rules so as to give itself the option of supposedly shutting down—wink, wink—the government down the road, without actually taking FBI agents, air traffic controllers, meat inspectors, foot soldiers in Afghanistan, or SEC financial regulators off the case. Add to this the fact that self-financing governmental entities—think of the post office and Amtrak—don’t have to shut down when Congress fails to pass a spending plan for the coming year, and you further minimize the impact of a so-called shutdown. Still, it would be preferable if this political charade weren’t possible, if any shutdown were the real deal, forcing U.S. troops in Afghanistan to go off-duty, food inspectors to look the other way, planes to be grounded by a lockdown of air traffic control, and so on and so on. Because then, obviously, we wouldn’t play these games. No one would ever again pretend we can turn the “off” switch on the government; no modern society can, and no one would be chuckling, in that lazy way we do with seatmates on a plane, “good riddance” to Uncle Sam. Set aside, for the moment, the partisan tones that usually run through this conversation. The federal government remains our collective instrument to meet the nation’s needs and challenges, though we can argue how big it needs to be to meet those needs. It’s proven durable over more than two centuries—a product of its brilliant design and our steady hand. Uncle Sam has delivered millions from poverty and oppression; unleashed the atom; connected the Pacific and the Atlantic; vanquished Hitler; underwritten numerous medical breakthroughs ;and laid the groundwork for the Internet. It has made mistakes. It can be an overreaching bully (just ask JPMorgan or detainees locked up at Guantánamo) and has apparently just coughed up a disastrous website. But it is us, and we should cherish, appreciate and take pride in it, even as we try to improve it. That’s why these farcical shutdowns are so tragic. They reinforce the misguided narrative that the federal government is an unwanted intruder in our lives, conveniently shut off at will. That doing so (at least the way the game is rigged) carries with it few negatives. Even the looking-glass nomenclature heightens the glib-fueled absurdity. By distinguishing between “essential” and “non-essential” government workers (the “non-essential” being the essential pawns in the political game), Congress advances the myth that government can be declared non-essential. Along this false spectrum of essentialness lies the military, which somehow has dodged association with government, even though it lies at government’s very core. How did we get to this semantic fantasyland where people feel they can rail against the government but worship the military? Republicans are rightly being blamed for the recent government shutdown, and polls suggest widespread disgust with the Tea Partiers’ antics. But both parties are complicit in setting the rules that allow these farcical shutdowns, and try to game them for tactical advantage. President Obama, for example, talked eloquently about not negotiating with zealots who resort to shutting down the government as a tactic to re-litigate legislative fights they have lost. But then he also made it easier for Republicans to pursue their gambit by signing legislation on the eve of the shutdown authorizing the timely payment of U.S. military personnel throughout the period. A stronger president would have pressed in the opposite direction, making it as much of an all-or-nothing proposition, to prevent millions of people like the two seated next to me on the plane from chuckling knowingly about how we don’t need a government. Would Senator Ted Cruz really have pushed for shutting down the government if it meant stopping payment to families of troops deployed overseas? Didn’t think so, and Obama shouldn’t have made it easier for Republicans to single out tax collectors, national park rangers, and whomever else we want to consider the essential pawns (those “non-essential” workers) of a political game played by both sides for tactical advantage. We have met the government, and it is us … and you can’t shut us down. It’s time we all acknowledged that. Andrés Martinez is editorial director of Zócalo Public Square and vice president of the New America Foundation. This article also appeared in the New America Foundation’s Weekly Wonk.